Christians who want extra-biblical stories about Heaven will no longer find them at Lifeway Christian Stores. 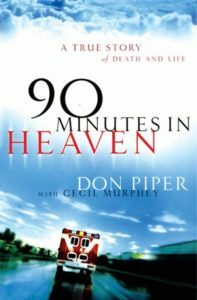 When I was working at Lifeway, I read 90 Minutes in Heaven. The book is surprisingly depressing. It offers very little Heaven description and many more of Piper’s confessions about him being an ill-behaved medical patient. Christians who want books with extra-biblical firsthand stories about Heaven will no longer find them at Lifeway Christian Stores. Baptist Press reports the Southern Baptist-affiliated retailer has pulled all its “heaven tourism” materials. LifeWay told Baptist Press about its decision to halt sales of heaven visitation resources today (March 24) in response to an inquiry about the book “90 Minutes in Heaven” by Don Piper, which is being made into a movie slated for release this fall. The book recounts Piper’s supposed experience of heaven following a severe auto accident and has sold 6.5 million copies in 46 languages. “Last summer, as we began developing LifeWay’s new structure and direction — what we’ve now identified as One LifeWay — the role of heaven visitation resources was included in our considerations. We decided these experiential testimonies about heaven would not be a part of our new direction, so we stopped re-ordering them for our stores last summer,” LifeWay spokesman Marty King told Baptist Press in written comments. Don Piper’s book was actually one of the earliest installments in the now-popular genre some call “heaven tourism,” in which the authors recount their own or their children’s near-death experiences. Other titles include Heaven Is For Real by Todd Burpo, whose son, Colton, is sticking by his story. 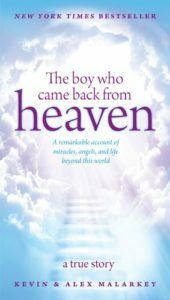 Lifeway in January already pulled The Boy Who Came Back from Heaven by Kevin Malarkey and ostensibly also by his son Alex. It turned out Alex himself recanted the story and even disavowed the notion of trying to picture Heaven apart from the Bible. Later accusations held Alex had never even consented to the book and in fact, despite his emotional and physical injuries, did not want it published. “Heaven tourism” books are coarse and rough and irritating, and they get everywhere. Too many Christians want to engage in the wrong kind of speculation. This is not speculation about something God has somehow “forbidden,” for anticipating or imagining heaven is not wrong! Rather, it is speculation that ignores or devalues the sufficient written word of God and replaces it with the words of human authors, who can be confused about what they believe they saw, or worse. Too many Christians are downright obsessed with the current version of heaven as if this is a static unchanged environment where we will live forever. Heaven today is certainly a wonderful place (filled with God’s glory and grace! ), but like Earth it’s destined for a drastic remodeling. Someday God will move New Heavens — His very home — to this very planet that has been fire-purged of all sin, the New Earth. That will make sainted humanity’s final eternal home not an out-there “heaven,” but a real and physical and glorious God-centered Place: the New Heavens and New Earth (Rev. 21:1-5). Explore more about what “heaven tourism” books means for Christian books and reading in Randy Streu’s article Heaven Malarkey: Lifeway, Tyndale and the State of Christian Publishing. Explore more about the flawed eternity notions Christians often believe by accident in my article The Top Six Myths about Heaven. And get the best and only sure word about Heaven, and then the New Heavens and New Earth, in the Bible itself — especially passages such as Isaiah 60, 65-66; Rom. 8; 1 Cor. 15; 2 Cor. 5; and Rev. 21-22.